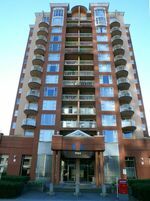 Fabulous, spacious condo in excellent centrally located Frontenac tower! This 900+sqft, 1+den/2bed, 2 full-bath, updated unit will not disappointment. BONUS: enjoy the huge 90+sqft balcony.Features: open layout, new apps, quality laminate through-out, tiles entry/kitchen/baths & designer paints. The living room features floor-ceiling windows & gas fireplace. The kitchen has room for eating area, lots counter & cupboard space. The large master has plenty of closet space, full 4pc ensuite & access to the balcony. Plus, this location cannot be beat: close to shopping, transit, WestCoast Express, recreation & highly anticipated Skytrain! Act now! Don't miss this one!